These two major strategic plans will shape some profound changes to our city and towns over the coming years. The four West of England councils (Bristol, South Gloucestershire, North Somerset, Bath & North East Somerset) together are working on a draft Joint Spatial Plan setting out how the area will accomodate 85,000 new homes and growth of 20%. The companion Joint Transport Study will shape how people travel, and whether we achieve the Bristol Cycle Campaign vision of ‘a city where cycling is so easy that everyone does it’. There’s many good words, as you’d expect they take account of the Bristol Cycle Strategy, and the Draft South Gloucestershire Cycle Strategy. Overall however we feel they’re in danger of rushing up the ‘business as usual’ path. Our full response is here: 2016-29-01JointSpatialPlanTransportStudy. Just click here to support our response, but remember to add your name and address. Bristol Cycling Campaign believes that everyone in the Greater Bristol area, whatever their age or ability, deserves safe and inviting space for cycling on all our streets. This should never be to the detriment of walking. Cycling is not just another mode of transport but is a key indicator of a successful, liveable, resilient and prosperous city region. Building roads vs managing traffic volumes. There is an underlying assumption in the JTS that a significant challenge to the dominance of private motor cars is unachievable through policy, nor likely through the emergence of disruptive market forces. There seems to be resignation to building more roads. BCyC argues that in urban areas it is just not feasible nor desirable to accommodate current volumes of private motor cars in the road space available, let alone any projected growth. For capacity and throughput issues alone there is no choice but to facilitate other travel options, limit private motor cars, and improve the environment for pedestrians. More emphasis should be given to possible behavioural changes through demand management, for instance to reduce the number of vehicles coming into Bristol city centre, so as to tackle air quality and make the place more pedestrian-friendly. Behavioural change is possible: for instance, there has been a 25% increase in bus usage in the last 18 months in Bristol. Large engineering projects vs smaller proposals and behavioural changes. The JTS concentrates on large capital projects at the expense of smaller proposals that would cumulatively deliver a sounder cost/benefit to more people at more locations, recognising the dispersed nature of travel journeys. In particular we note that cycling projects and improvements offer outstanding benefit to cost returns, but can be delivered for such low relative costs that they are often apparent afterthoughts bolted on to other schemes. They are not considered, planned, evaluated or prioritised as strategic programmes capable of delivering transformational change. Transport mode hierarchy. It needs to be acknowledged that the habit of cycling is ‘fragile’. It doesn’t take many bad experiences to make people give up, and two thirds of people currently think cycling is too risky for them to consider it. The JTS seems to make no mention of the transport hierarchy which is an essential part of transport policy, enshrined in JLTP. For the highway schemes proposed, eg “strategic corridors”, “better connectivity”, the benefit is unclear between the transport modes – active travel, public transport, private transport. If the JTS were to pay heed to the transport hierarchy, it might allocate budget taking that into account, and it would influence the choice of and design of schemes. The schemes proposed by JTS give good weight to public transport, but not enough to cycling and walking. The JTS should more clearly recognise the health impacts of different modes of travel, and include this in the cost-benefit analysis. Walking and cycling should retain their position at the top of the transport hierarchy when developing schemes. This means they should be planned and designed for first, with other modes fitting around their tighter constraints (and greater benefits). We share the concerns of others about the structure of the consultation, and therefore the value of the consultation responses. The JTS jumps straight from principles to 13 possible ‘scheme concept’ packages. It does not offer a reasoned analysis of the most cost-effective way to solve the transport problems it identifies. Having identified key issues of dispersed and complex trip patterns, car dependency and congestion, and network resilience, there should be an analysis of alternative ways of addressing these issues. The JTS is centred too much on schemes, not enough on strategies, based on spatial analysis. The list of funding packages should emerge from a strategy to create an integrated transport network. It is too early in the process to be clear on scheme options. The JTS makes no mention of the relative size, impact, value for money, deliverability of schemes, yet asks the public to choose between them. It also locks in from the start a mode and fragmented approach that is at odds with limited aspirations for corridor and area based packages. We consider it essential that there is a strategic understanding and commitment in the JTS to deliver three continuous highway networks. 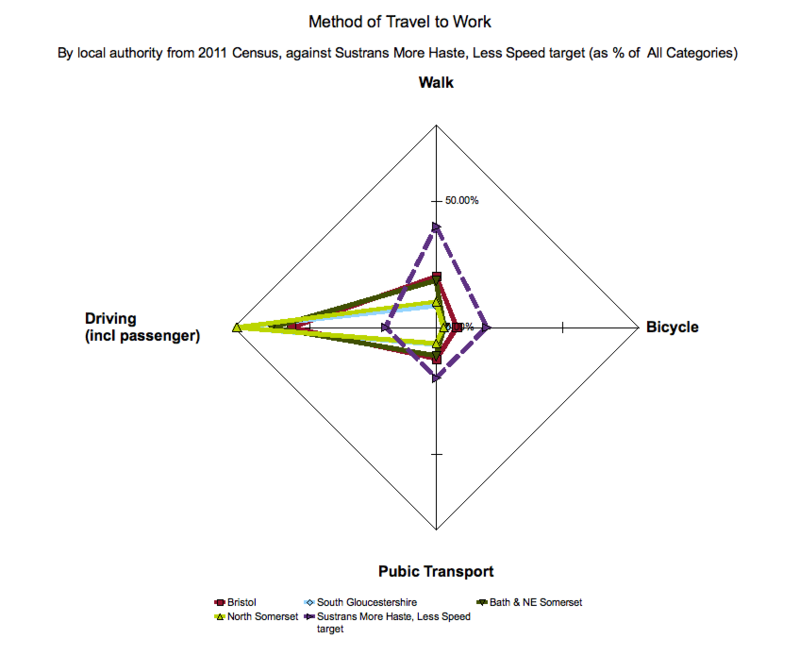 Cycling, walking and driving need different networks with different design requirements. Wherever there are significant difference in speed or volume providing space for each of these groups avoids conflict between them, increasing subjective safety, making cycling the instinctive choice. The walking and driving networks are largely in place, but can be improved. The cycling network is largely missing. Those cycling are forced inappropriately and uncomfortably onto one of the other two, causing conflict and danger BCyC Policy – Shared Space Streets and Shared Use Pavements. As volumes increase something that worked with a handful of people cycling will cease to function for anyone. Or people will choose not to cycle. This is why it is imperative to create Space for Cycling as set out in makingspaceforcycling.org. All of the spatial scenarios outlined in the JSP have points of merit but we consider scenarios 2 (Bristol-focused), 3 (Transport-focused) and 4 (other towns) should in some combination determine the choice of location of new development. In principle we are in favour of urban intensification in Bristol with its potential to reduce travel distances and favour walking and cycling. Distances from where people live to where they work, shop, play and learn must become shorter. It is essential that provision is made to improve green infrastructure with walking and cycling links through and out of the urban areas. If there is to be a package focus, for example through MetroBus and MetroWest, then we consider that MetroCycle should stand alongside them. It is possible to argue also for ‘MetroWalk’ but we would say that it is a measure of whether real ‘Space for Cycling’ has been delivered to Triple A standards (see above) that there is at least an equivalent improvement to the walking environment. We are concerned that there are currently weak controls on housing developments, in particular those driven by the large housing firms, which rarely make adequate provision for strategic visions and plans. They are more likely to create transport problems than to help solve them. There is extensive reference to ‘existing cycle routes’ as if that were enough to provide good access to sustainable transport. These routes are usually hopelessly inadequate, or used at or beyond their design capacity (Bristol Bath Railway Path). We welcome the statement in the Issues and Options paper to ‘focus new housing and employment which facilitate public transport and active travel methods and limit substantial new housing and employment in locations which would exacerbate unsustainable travel patterns’. The challenge is in what this actually means when the pressure will be to meet existing demands and not those of the future. An integrated corridor approach is to be welcomed, as is the proposed use of de-trunking of road to allow more suitable use. The guiding theme needs to be a willingness to do what is necessary to maximise capacity and increase use of modes that bring net benefits to all, specifically walking and cycling. Public spaces should be used to produce public benefits. Mention of a willingness to reduce parking along main roads is essential. We would like to see a full recognition of the importance of interchanges to all modes, and in particular to and from walking. Obvious ones include major rail and bus stations, Park and Ride sites and car parks, but this also applies to local bus stops, retail centres, education, leisure. This is particularly important to cycling where parking and security are critical. While some people will walk long distances, and others take the bus for a short distance, it is the 1km to 10km trips where cycling is uniquely placed to be the instinctive choice. To achieve the benefits of more people cycling, the potential cycle network must be excellent, highly visible and the quickest mode of travel for trips up to 10km. This means STARTING with the cycling network when planning developments and transport. It is important to set targets for how we are going to rebalance the journey share envelope for the benefit of health, economy and environment. We suggest it would be helpful to set out an aspiration for 80% of trips to be by sustainable travel modes (as proposed by Sustrans). This should mean 40% walking, 20% public transport, 20% cycle. Using figures from 2011 travel to work census data this means doubling walking, tripling cycling, 60% more public transport and 60% less driving. By 2036, for health, environment, and economic issues, the figure will need be have caught up with leading European cities with levels of towards 50%. When considering a target of 20% cycling it is important to take account of what might be called the four types of Bristol Cyclist. Those who are most likely and willing to cycle are mostly already doing so. Provision must be excellent to achieve much more than current levels.